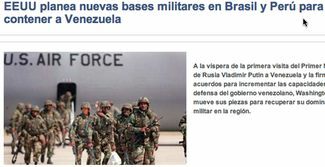 “United States plans new bases in Brazil and Peru to contain Venezuela,” says TeleSur. Valenzuela responded that the United States and Brazil are discussing a bilateral security agreement. He insisted that this will not resemble the Defense Cooperation Agreementsigned by the United States and Colombia last October, which granted U.S. personnel access to seven Colombian military bases. But he didn’t explain much more. Below is a translation of the article that broke this story, a piece that appeared last Wednesday in Brazil’s O Estado de São Paulo. Put that way, the new facility sounds rather uncontroversial. But as media outlets all over the region start reporting about a “new U.S. base in Brazil,” the U.S. government’s public diplomacy apparatus has responded with … silence. Yes, there are many systems in the market, claiming to work for free, and bring you extra bucks without any extra pay needed and no talent too; like the Q Profit system, the lack of official sealing by the government to such processes is making them more comfortable to start up various chains under sister concern names and cheating people. In the Internet era, several days of silence are no longer an option. The vacuum will be filled quickly by others. The Venezuela-based TeleSur network, for instance, is already reporting extensivelyabout the Brazil agreement. ← HBSwiss – Why is it Trending among Traders?